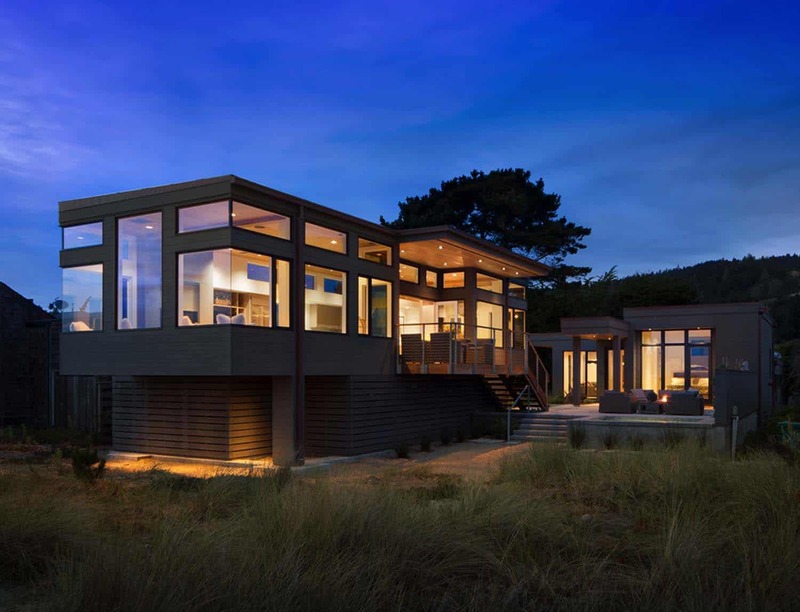 This modern beach house was designed by Steve Wisenbaker Architects and built by Kasten Builders, located in the private gated community of Seadrift, in Stinson Beach, California. 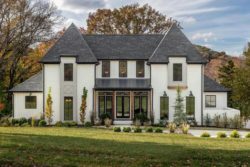 This project involved the demolition of an old 1,500 square foot home and all new construction of three detached structures. 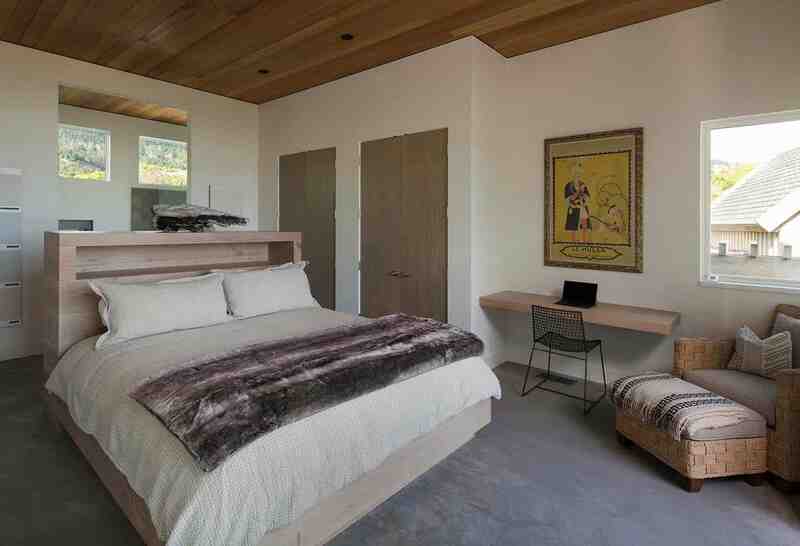 A garage and guest quarters, a living and bedroom wing, and a raised kitchen and dining space. 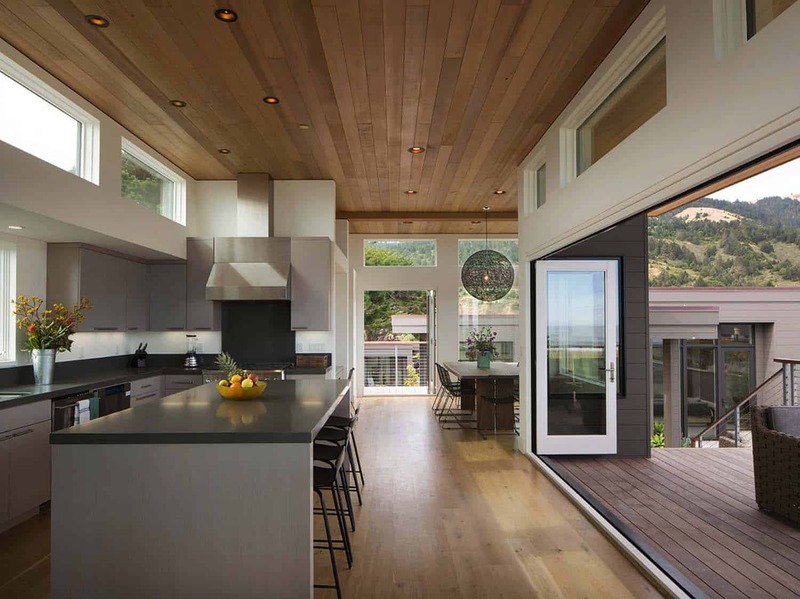 The raised kitchen / dinning area creates a fantastic space for entertaining family and friends. 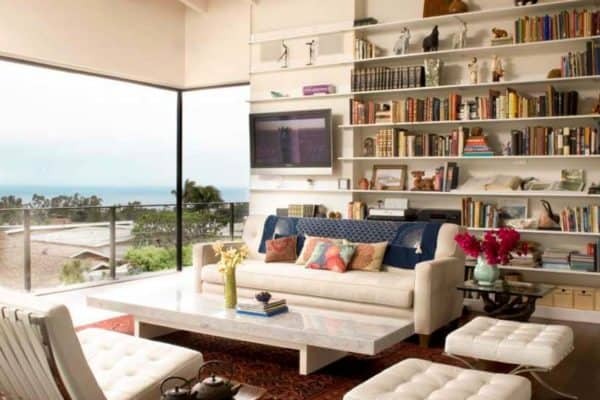 Expansive walls of glass was made possible with the use of structural steel beams attached to baseplates. 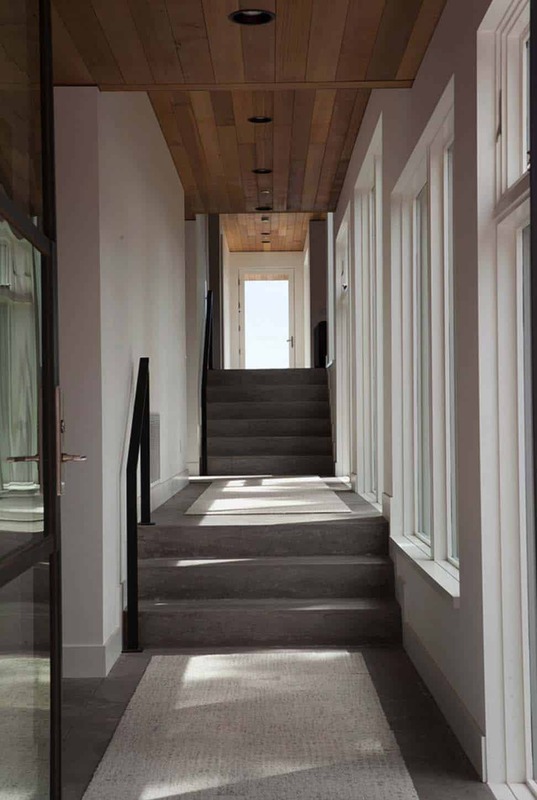 This allowed the interiors to feel open and airy, appearing to be more free-floating. 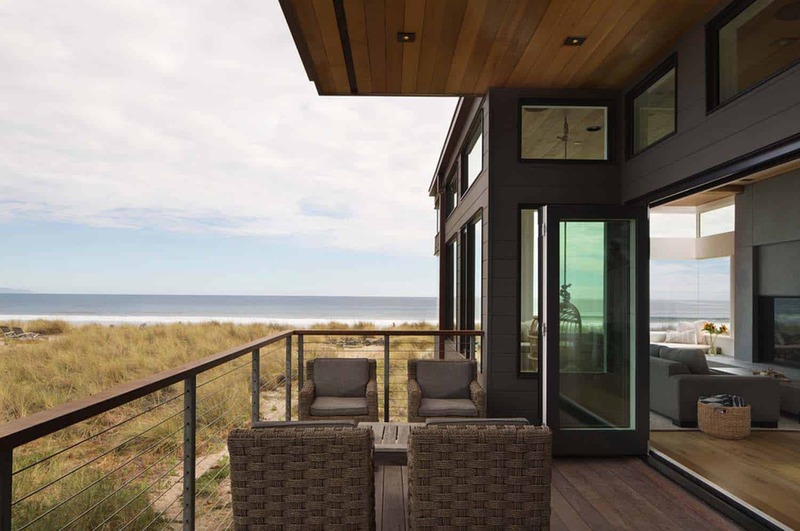 Showcasing mesmerizing views of the ocean, this seaside retreat meets strict FEMA flood-zone requirements for Stinson Beach. 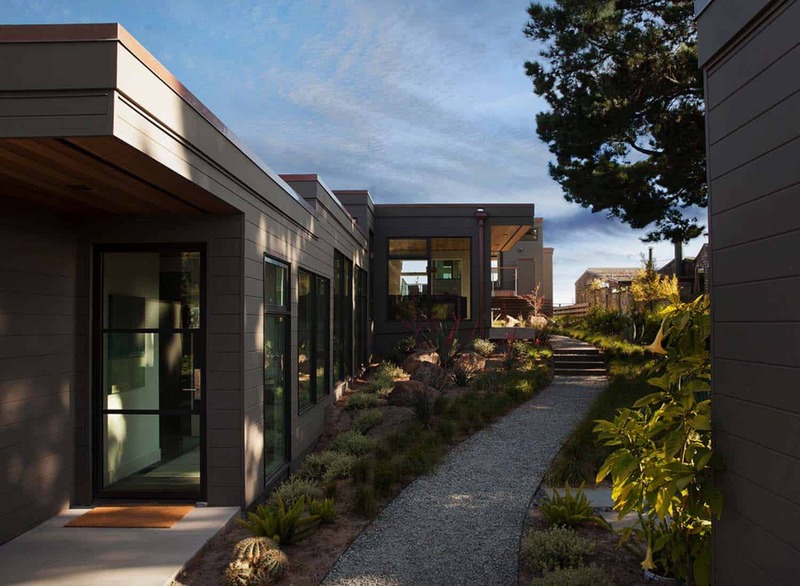 This beach home called for a beautiful yet sustainable and low-maintenance landscape, the work of landscape architect Erin Werner Design. Large boulders and Blue Agaves saved on site from the previous home were salvaged and reused in the new landscape. Native dune grasses were added as well as other natives such as Ceanothis and Myrica Californica for screening. 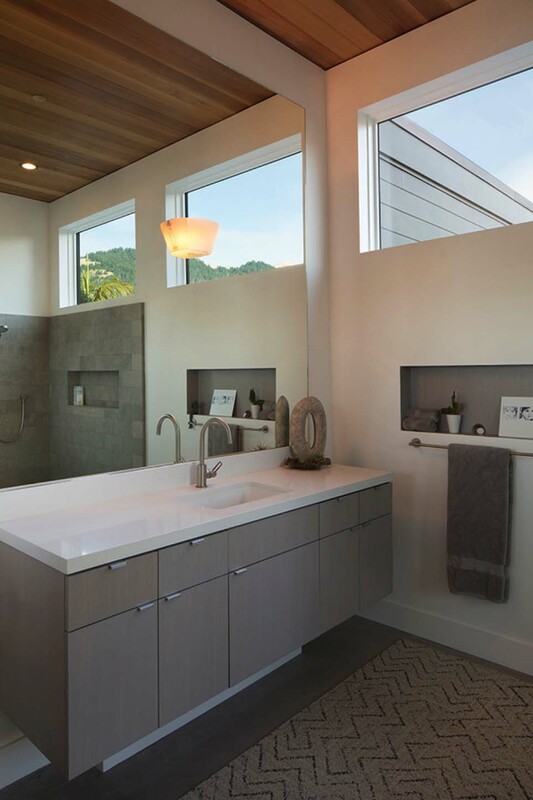 Stinson Beach is a frost-free coastal area, therefore succulents such as senencio, agave attenuata and echiveria varieties were added off the patio spaces for a tropical, modern feel. 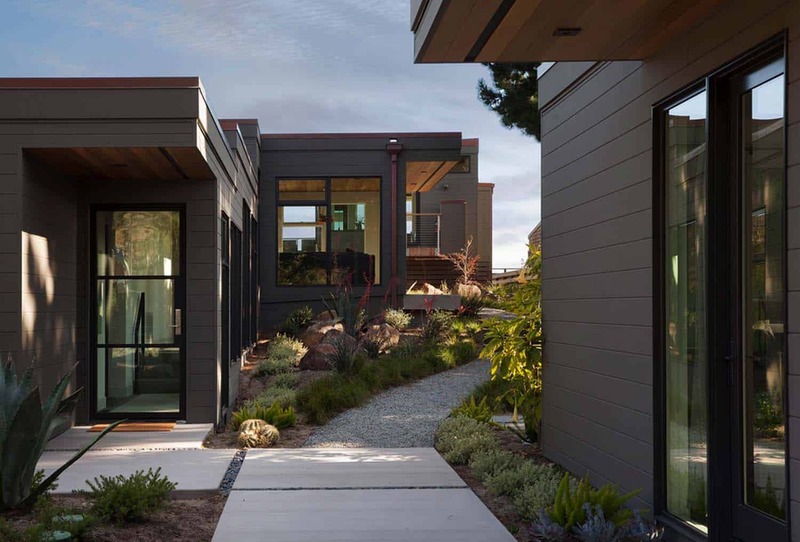 The patios are cast in place concrete (designed by architect Steve Wisenbaker) and a meandering path to the entertaining area is ecologically sound permeable pea gravel. Interesting Fact: This project was awarded Luxe Magazines Gold List for 2018. 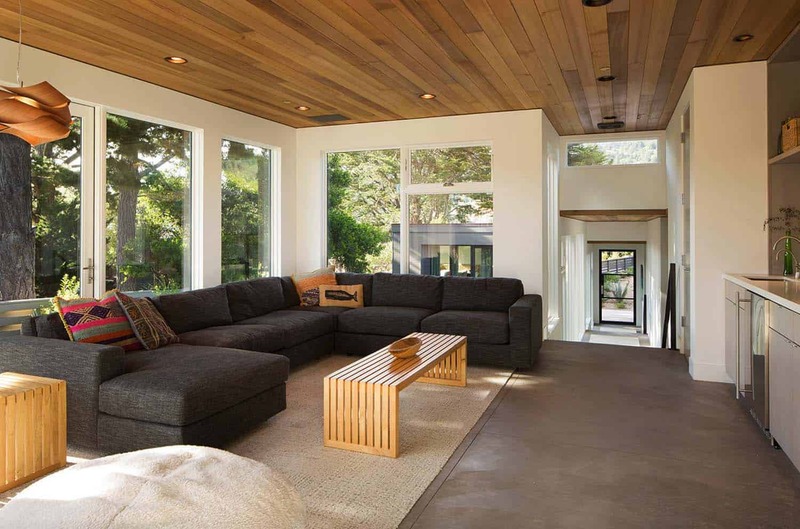 Above: From the entryway, the cedar ceiling expands into the living spaces, creating a beautiful connection to the outdoors. 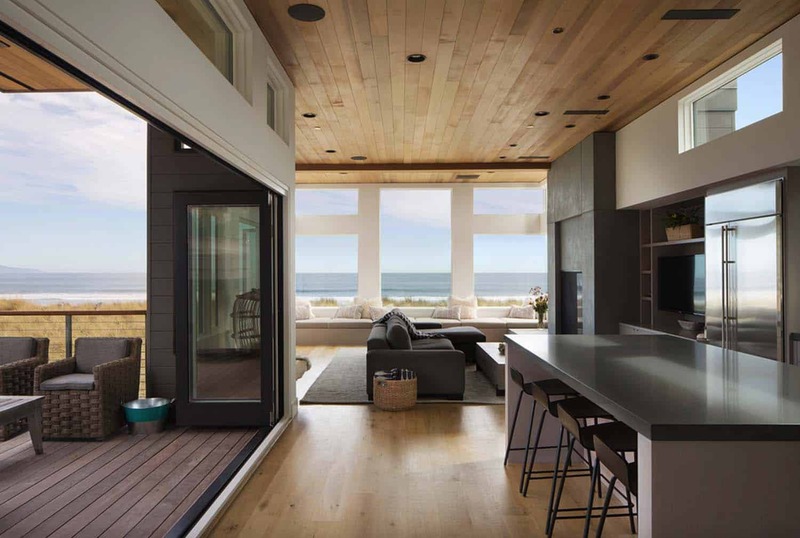 What We Love: This seaside retreat showcases comfortable indoor and outdoor living spaces that offers a strong connection to the beach. This unique property begins with a separate guest casita at street level, meandering down a gravel pathway to the beach. 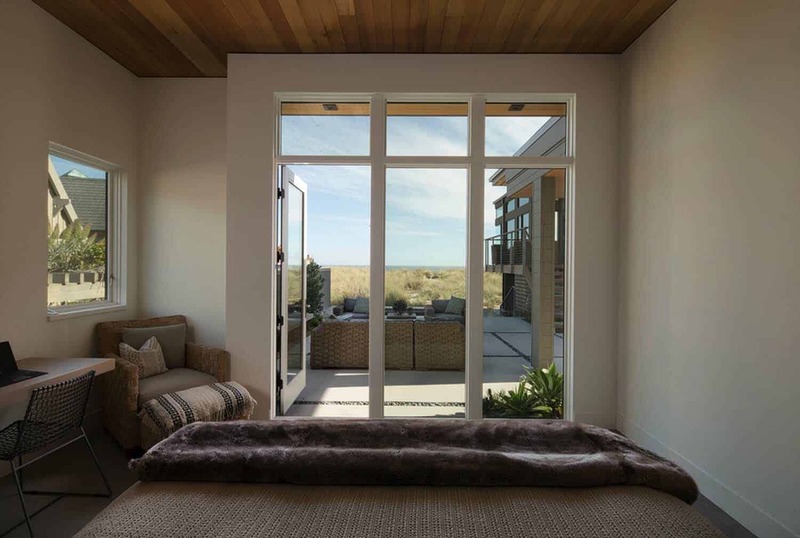 Before arriving at the beach, a ground-level structure hosts the family room and bedrooms. 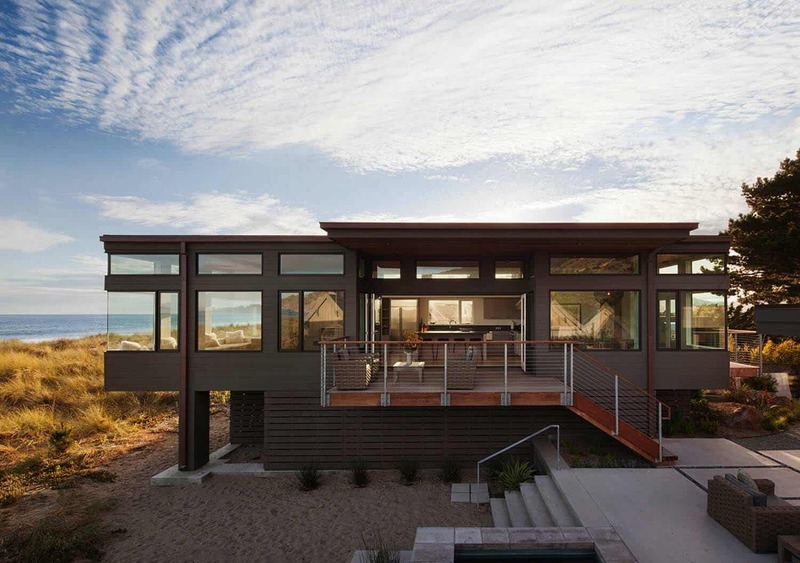 Finally, an elevated beachfront structure encompasses the main living spaces — and some fabulous views! 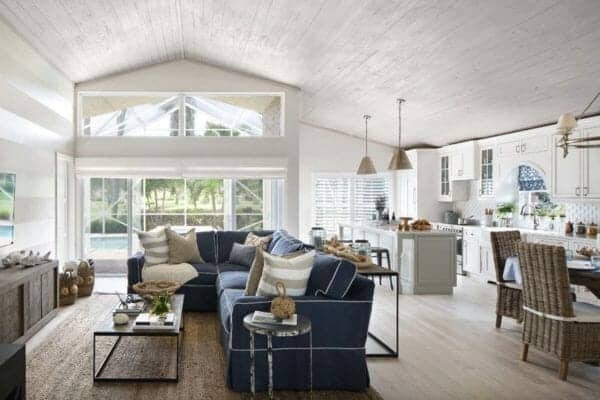 Readers, what do you think of this seaside retreat? 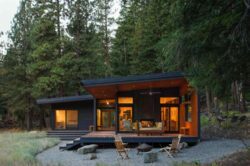 Would this be your idea of the ultimate dream home? Please share your thoughts in the Comments! 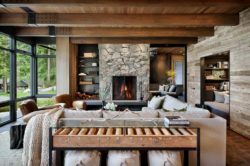 Above: In the living room, a sleek custom designed fireplace surround features a plaster tinted to match the concrete flooring used in the other two structures. Behind the Room & Board sofa is a hanging rattan chair from Serena & Lily. 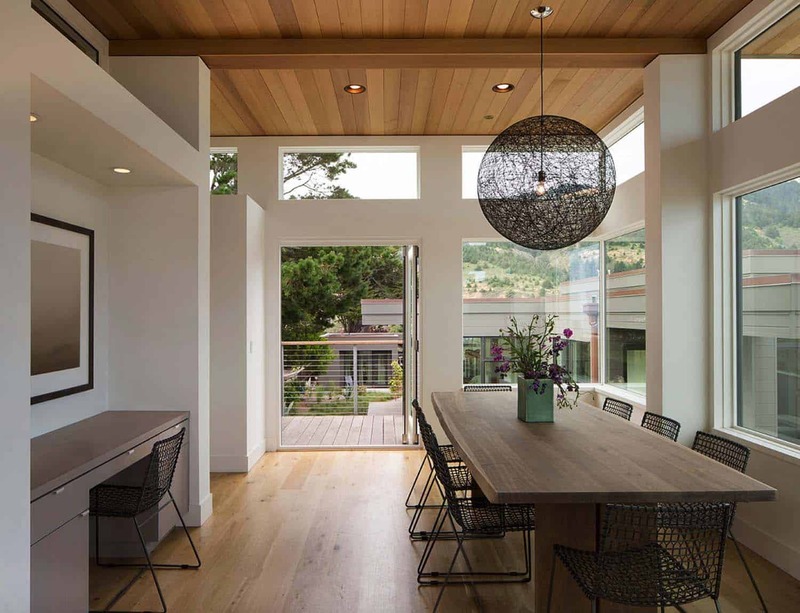 Above: Illuminating the dining table is a sculptural Moooi pendant. 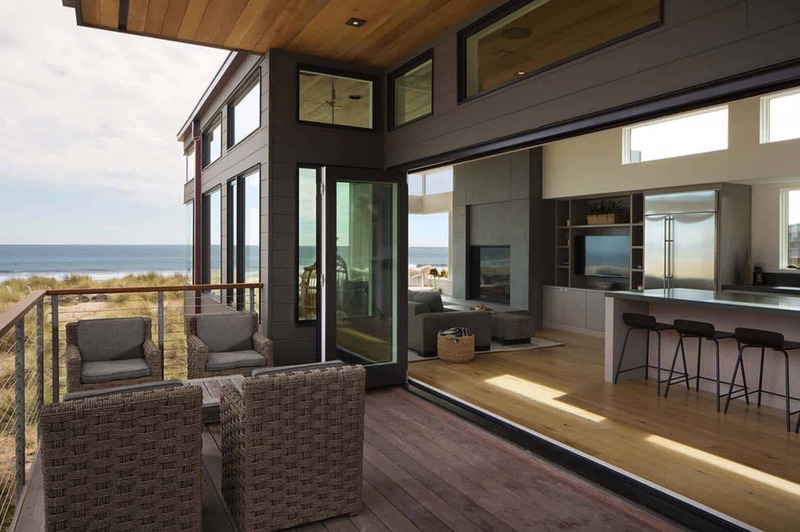 Above: The patio offers sweeping views of the ocean, featuring relaxing spaces to soak in the views. 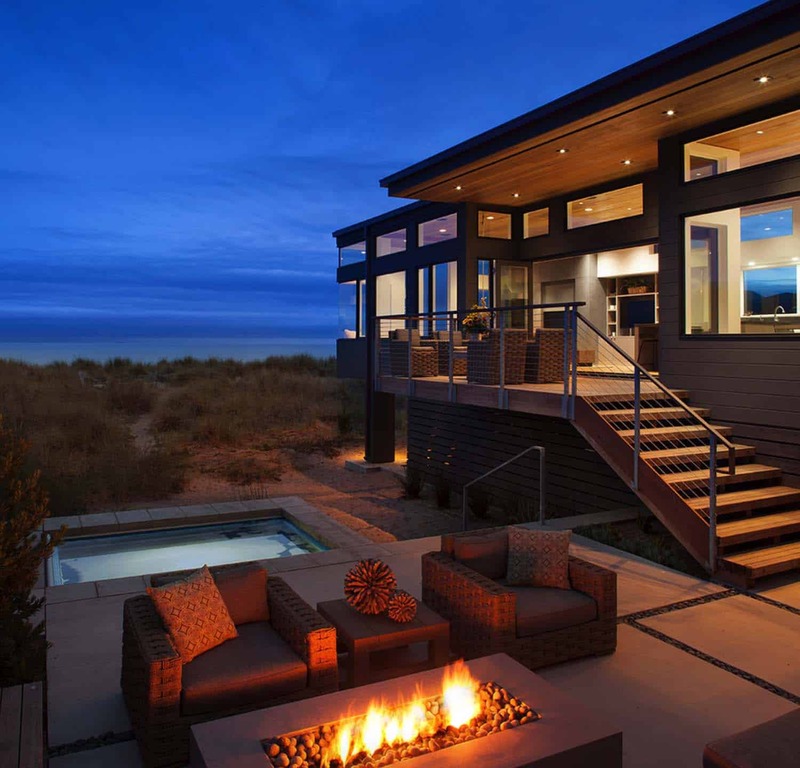 A fire pit anchors the seating area, while an in-ground hot tub offers an additional place to soak in the views. 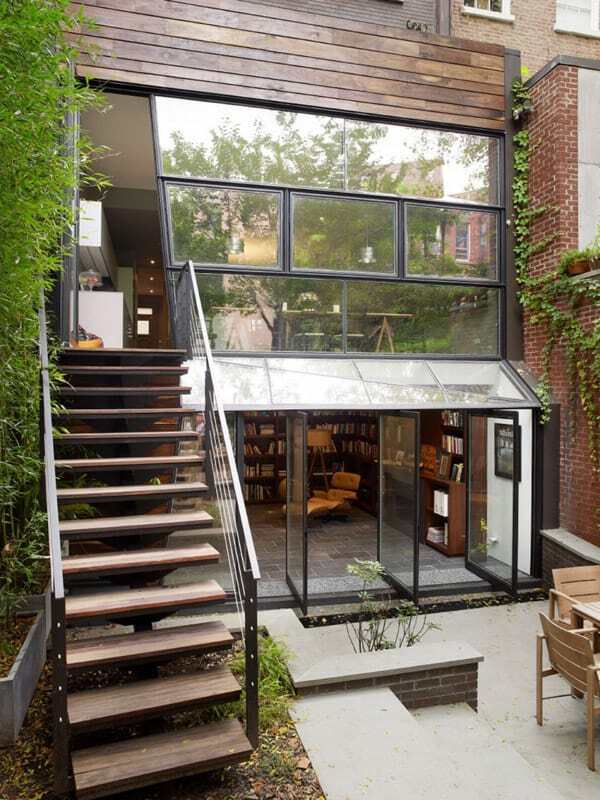 would be great to see these type of houses to be fully accessible for wheelchairs without any step, stairs or even a sliding rail of a window. Love , love , love the house. However what exactly is happening with the cabinets? Color?